The life of two hostages, Japanese war journalist Kenjo Goto and captured Jordanian pilot Mu’ath al-Kasaesbeh,continues to hang in limbo. The Jordanian government had earlier agreed to release failed female suicide bomber Sajida al-Rishawi held captive by them since 2005 to ensure the safe release of both the aforementioned hostages helped by the ISIS militants. As the suspicion about the Jordanian pilot being alive in their captivity gained ground, the proposed swap between the two has been put on hold. 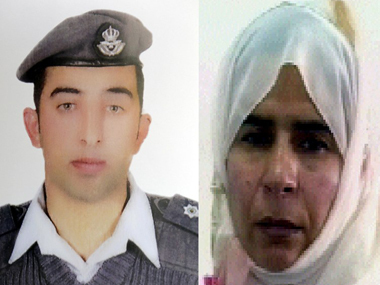 Mohammad al-Momani, a spokesman for the Jordanian government said Thursday night that his government would not proceed with the release of Sajida al-Rishawi because the extremists had not provided proof that al-Kasaesbeh remains alive. Rishawi is on death row for her role in a 2005 suicide bomb attack that killed 60 people in Amman. “We need a proof of life, so we cannot proceed with what we have announced yesterday regarding the exchange between Sajida and the Jordanian pilot,” said al-Momani. Though neither of the two parties to the proposed swap (Jordan and the ISIS) have elaborated on it, it is being widely believed that the militant group will also free the Japanese captive Goto simultaneously if the suicide bomber of Iraqi origin is released. The militant group had threatened to kill them both if the release was not carried out by the by the sunset deadline set by them, but no new developments in the case were reported even after half a day had passed since the lapse of time period stipulated by them. “We have nothing particularly to report” to media outlets about developments of the hostage crisis, Foreign Minister Fumio Kishida told reporters Friday morning. The Islamic state militants have, in the last few months, beheaded at least five western hostages, showing utter disregard for life and gone on to share the videos of the barbaric beheadings on YouTube. Only a few days back, they are believed to have meted out the same treatment to another Japanese hostage, Haruna Yukawa , held by them. This is the first time that the militant group which is now strengthening its hold over Iraq and Syria has publicly demanded a swap of hostages.